More with Less Today (that’s me!) had a little mention in All You Magazine as a favorite blogger in the September issue. I feel like Sally Field, “they like me, they really like me!” I wish my dearly departed Dad could have seen me. He always knew I was a “late bloomer” and would some day find my passion. Check out the September issue of All You Magazine . 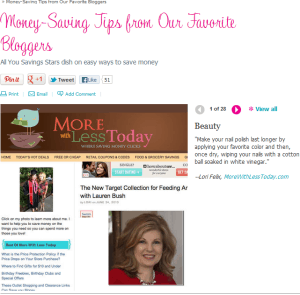 Not just for my tip, because it is full if coupons, deals, easy recipes, practical and affordable beauty tips, fashion, and plain old good information. This is the one magazine that pays for itself, over and over.